Authorities in Indonesia have confiscated two juvenile Sumatran orangutans, a critically endangered species, being kept as pets. Possession of an orangutan is punishable by up to five years in Indonesia, but authorities have never prosecuted any pet owners, who tend to be power and influential figures, and instead go after the poachers and traders. Conservationists say there needs to be legal consequences for keeping orangutans as pets, in order to discourage the illegal trade, which involves poachers killing mother apes to capture babies and juveniles. BANDA ACEH, Indonesia — A recent seizure of two young orangutans from households in Indonesia has once again highlighted the lack of legal consequences for people who keep the near-extinct apes as pets. Officials from the local conservation agency and Gunung Leuser National Park in the province of Aceh confiscated the juvenile Sumatran orangutans (Pongo abelii), a critically endangered species, on Jan. 22 and 23. One of the apes had reportedly been kept as a pet for at least six months. 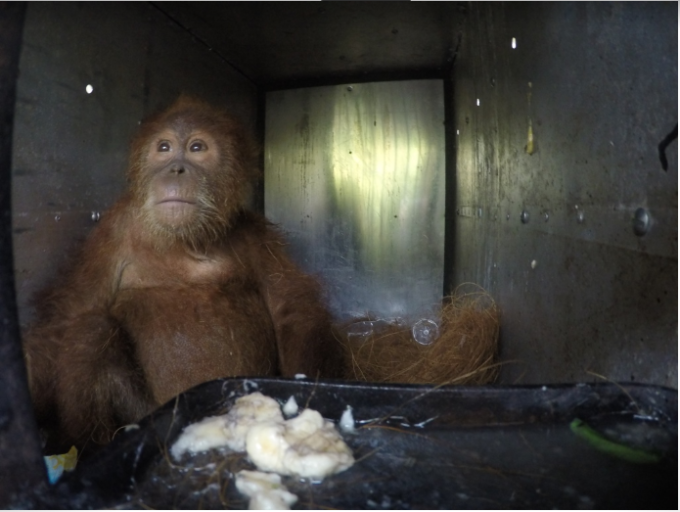 Both were taken to a rehabilitation center in neighboring North Sumatra province for treatment, ahead of a possible release back into the wild. However, the people who held the orangutans captive have not been charged with any crime, despite possession of a protected species — which in Indonesia includes orangutans — carrying a prison sentence of up to five years. Aceh province, in red at the northern tip of the island of Sumatra, is where four in five illegally traded orangutans come from. Image courtesy of TUBS/Wikimedia Commons. 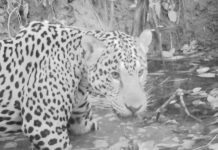 Sapto Aji Prabowo, the head of the Aceh conservation agency, acknowledged that while his office often pressed charges against wildlife traders, it didn’t go after the buyers. The latter are only given a warning and obliged to give up the orangutans, he said. Between 2013 and 2018, authorities in Aceh, which is home to the Leuser Ecosystem, one of the last great orangutan habitats left on Earth, seized 40 of the apes that were being kept as pets. 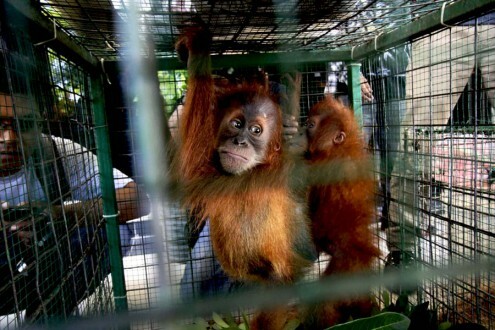 The practice of taking young orangutans from the wild nearly always involves the poachers killing the mothers. Sapto said that to discourage the illegal pet trade, it was important to start imposing criminal charges against pet owners. Such a move would be unprecedented: No individual in Indonesia has ever faced charges for keeping an orangutan as a pet. These owners tend to be powerful figures — senior police or military officers and politicians — who can afford to pay for an orangutan’s upkeep and get away with having one in their household. The owners of the two orangutans seized in January have not been identified. 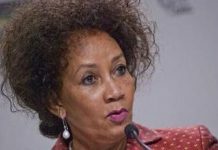 Sapto didn’t elaborate on how he planned to start going after the owners, including overcoming the challenge of prosecuting influential figures accustomed to acting with impunity. This critically endangered Sumatran orangutan was rescued by forest rangers after being kept as an illegal pet in the town of Kutacane, in Indonesia’s Aceh province. Image courtesy of Orangutan Information Centre. An estimated 80 percent of the orangutans traded within Indonesia and abroad come from Aceh, according to Panut Hadisiswoyo, head of the Sustainable Sumatran Orangutan Foundation—Orangutan Information Centre. Thousands of orangutans, including babies and juveniles prized for the prestige they bestow on their human owners, have fallen victim to the illegal trade that has helped push these great apes to the brink of extinction. The practice has been exacerbated by the continuing loss of the ape’s forest habitat, much of it cleared to make way for oil palm plantations. 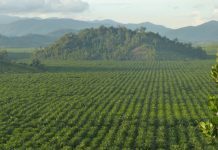 Indonesia has lost more rainforest than any other country since the turn of the century, when the plantation industry began a relentless expansion that made the archipelagic nation the world’s top producer of palm oil, a commodity found in everything from ice cream to laundry detergent. These baby orangutans were confiscated from a trafficker in Aceh province in 2015. Image by Junaidi Hanafiah/Mongabay Indonesia. Orphaned orangutans can be sold into a vast network of traffickers that extends throughout Indonesia and beyond. Those fortunate enough to be rescued by authorities or handed in by their owners after growing too big and unwieldy to keep as pets have to undergo special treatment to ensure they can be released back into the wild. But that’s not an option for many of these apes, who might have sustained permanent injuries or contracted a contagious disease during their time in captivity. For such apes, life after the pet trade is confined to rehabilitation centers that are already crowded. Conservationists say there needs to be a halt to forest-clearing activities to stop orangutans from being pushed out of their habitats. 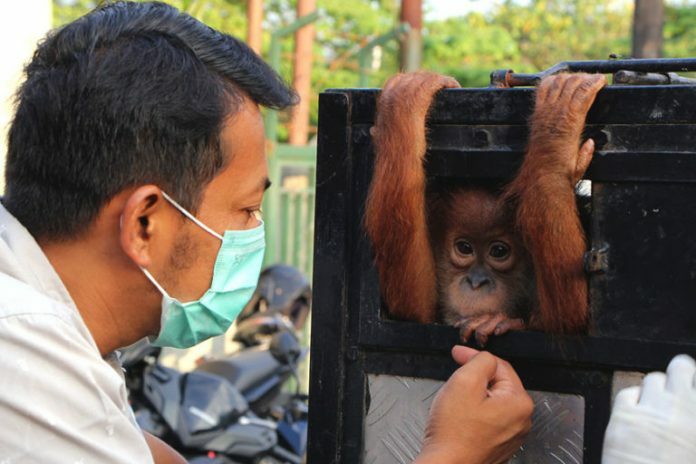 They also say forests that have already been degraded need to be restored and protected, so that rescued orangutans deemed ready for release back into the wild can have a new home safe from human threats. “Degraded forests should be immediately restored instead of converting them into oil palm plantations, so that wildlife habitats aren’t reduced,” said Teuku Muhammad Zulfikar, a coordinator at the NGO Yayasan Ekosistem Lestari (YEL). Two juvenile orangutans were confiscated by authorities in January this year, but the people who kept them as pets have not been charged with any crime. Image by Ayat S. Karokaro/Mongabay Indonesia. 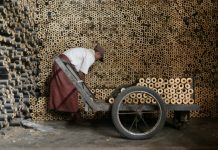 This story was reported by Mongabay’s Indonesia team and was first published on our Indonesian site on Jan. 28, 2019.